The scandal that sees many people with learning disabilities and challenging behaviour cared for in hospital rather than in community settings needs ‘urgent and sustained action’, according to Mencap chief executive Jan Tregelles. 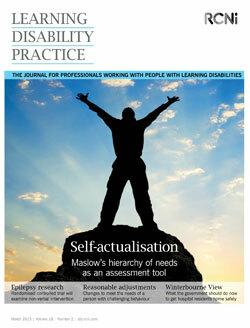 Ms Tregelles is one member of an expert panel discussing the issue in this month’s Learning Disability Practice journal. Care minister Norman Lamb took responsibility for the closure programme in the wake of the scandal at Winterbourne View, an assessment and treatment hospital in which workers abused people with learning disabilities. The panel gave their views on what the government should do to put right the lack of progress in getting people out of institutionalised care. Their comments follow the publication of a National Audit Office report on the government’s failure to move people with learning disabilities and challenging behaviour from hospital to more suitable accommodation by its own deadline of June 2014. Ms Tregelles says the government, NHS England and local authorities must agree on a nationwide closure programme of inpatient settings and invest in the development of local services.